If you don’t have any of the Girl & Hair: Under Hair Care products in your hair routine, you’re slipping! 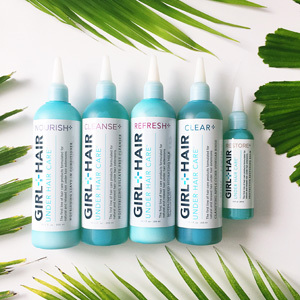 With a mission to help women achieve thick and healthy hair, Dr. Camille Verovic founded Girl & Hair, which is home to her Under Hair Care products that are cruelty-free and free of harsh and harmful ingredients. Whether you’re sporting a natural style or keeping your hair protected under weave or braids, you’re definitely going to want to add these natural products to your regimen that promote growth, relieve itch, and prevent odor. Camille is the boss and brains behind the brand, and I recently chatted with her about her groundbreaking brand, the importance of hair care, and her tips to growing healthy hair! Tell us a little bit about yourself and your brand, Girl & Hair Under Hair Care! My name is Camille, I am the founder of Girl & Hair Under Hair Care, and I’m also a physician! Girl & Hair really started out of necessity, and out of a problem that I had when I was trying to cleanse and properly take care of my hair right after I got the big chop. I was wearing a lot of protective styles like braids and sew-in weaves, and I couldn’t find anything on the shelves of retailers that would take care of my hair properly when I had those extensions in. And at that time when I did the big chop, I was really into ingredients because you know when you do the big chop you’re really into preserving and discovering that natural hair after the fact. 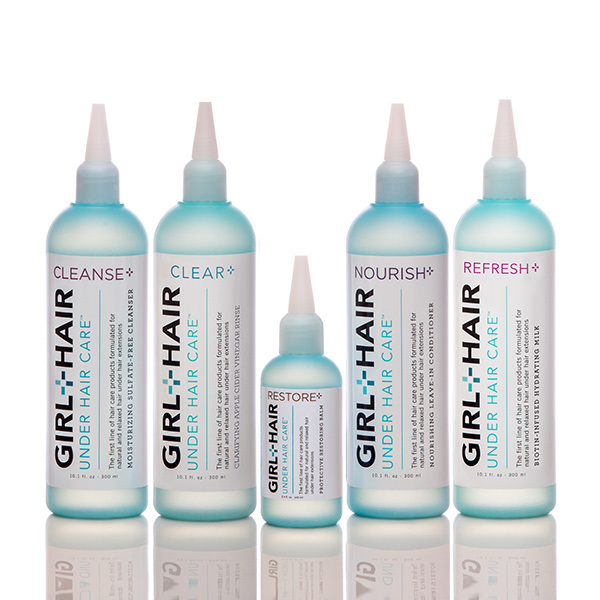 So out of necessity and not being able to find something that I really wanted in a product, the concept of Girl & Hair Under Hair Care was formed. So, I understand that you went from being in marketing to medicine, to entrepreneurship…tell us a little bit about that journey. The story goes actually all the way back to when I was in college. I originally wanted to do medicine but I was a college basketball player, and we used to travel a lot. At that time it was really hard for me to devote a lot of time and energy into my sciences, so in college, I switched my major, graduated with a degree in marketing, and I worked for some years in marketing before I actually decided to go back to medical school. I still wanted to pursue the sciences so I did my post-back studies, got into medical school, and the rest is history! How has being a physician helped with the success of your brand? I feel like it really sets our brand apart because not only am I aware of a problem that I personally had, but I can apply some of those problem-solving concepts to developing a brand. For example, thinking about ingredients that are not big allergens. And there aren’t really a lot of black physicians in general…I’m also a dermatology resident right now, and I just finished my residency in general medicine and I start a second residency in dermatology so that is especially important when I think of all the scalp conditions I see, especially with black women, throughout the week. I see a lot of hair loss problems, dandruff problems, and all these different things that other brands may be aware of…but they have to hire someone to assist with that, so it’s nice that I have a really insightful vantage point and reason behind why we’re what we’re doing. I have an amazing husband! My husband is like the man behind the brand because he really does so much for the brand. My husband Josef handles all the logistics right now while I’m finishing up residency. So, I have to give credit where credit is due! My husband is really supportive of the brand. How did you land the Target opportunity? The Target opportunity came out of a program we did call the Target Accelerator Program. It’s a program in which Target finds new, up-and-coming brands…and they’re kind of like mentors for these brands that are at different stages of development. They choose people to be a part of this program, so we were fortunate enough to be chosen. We had an incredible and very helpful group of mentors at Target that really dissected our business. They found what we were strong at, what we were not so strong at, and they really assessed if we were ready to move to the next level: mass retail. That was something we had to make sure we wanted. People usually think it’s something that they want, but it’s so important to know how to be successful at that level. So, being on the shelves at Target stemmed from that! What would you say is your best product for someone who is trying to grow out their hair? So, I’m going to put my doctor and dermatology resident hat on, and think if I were to choose the most important product, it would be our Cleanse. When I’m at the office, and even in the comments on our Instagram posts, a lot of women say that when they wear protective styles they don’t always wash their hair that frequently. People are scared of messing up their hairstyle or scared of their braids getting frizzy, but I think cleansing is definitely one of the important steps to a healthy scalp and healthy hair. I’m all about hair and scalp health. Which product is your personal favorite? Personally, my favorite product is the Restoring Hair Balm. It’s a castor oil-based product, and it’s a very thick oil. I find that it’s like a coat on the hair shaft which I personally like. I like heavier oils when my hair is in a protective style As opposed to when I am styling it, when it’s not in a protective style, I like lighter oils, but that’s my personal favorite. Can women still use your products even if they’re not wearing their hair naturally or in protective styles? Yes! The products are typically used for protective styles; however, people use them while not in a productive style as well. So, all of our products can be used out of a protective style too. As a matter of fact, people will buy our products when they have a protective style and then they’ll end up liking it so much that they use it even outside of that. What is one key thing we should know about your brand? I feel like one of the biggest things about our brand, is that it’s really about the idea of self-care and caring for the hair. And this not only encompasses styles and how you look on the outside but caring for the inside is basically the foundational concept of Under Hair Care. You want to protect your hair and want it to look nice but that’s the superficial picture. Underneath your hair has to be cared for too. One of the things that I always say is “Live your best anagen.” People always ask me “What is anagen?” So, the phases of hair growth are broken up into 3: catagen, anagen, and telogen. Anagen is the active phase of hair growth. 80% of the hair on your head is always in the anagen phase and the rest is either actively resting or actively falling out. So when I say “Live your best anagen,” it’s always about being your best self and living however you can to foster that growth…that active phase of growth in your life, and that’s like the same concept when I think about under hair care. 80% of the hair is actively growing and you want to be the best you can be at that 80%. You can find all of our products on our website. You can also find our products in Target, Sally Beauty, Bed, Bath and Beyond, Harmon Face Values, Ricky’s NYC, and Amazon Prime. Follow Girl and Hair Under Hair Care on Instagram to stay connected!